Did you know that Penn State’s Center for Concussion Research and Service offers baseline concussion testing? Student athlete performing a baseline concussion test. Photo by Patrick Mansell. Many contact sports leagues — from junior high and high school sports teams to the NFL — require their athletes to undergo baseline testing before the season begins. Establishing a baseline is important so that doctors can test against it should the athlete experience a traumatic brain injury, or concussion, during the season. Concussion testing can be mentally draining, whether a person is concussed or not. Baseline concussion testing includes four different types of tests: balance, memory, reaction, and an electroencephalogram (EEG). 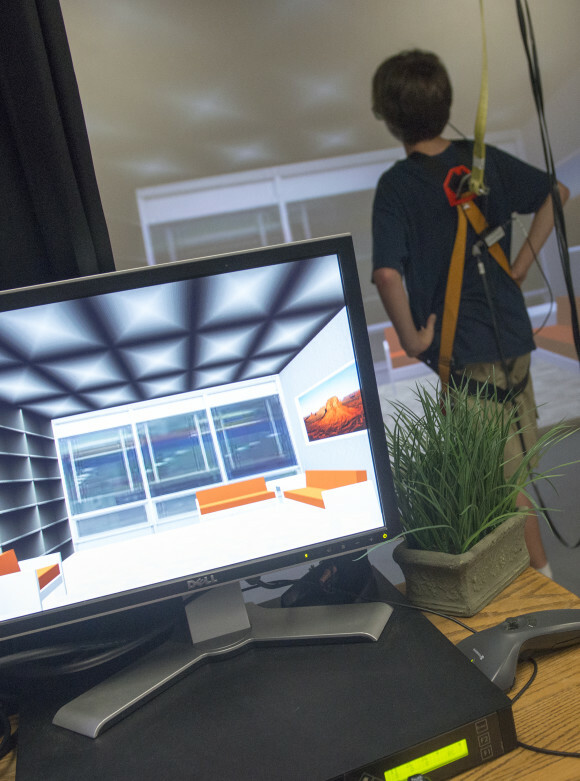 The first three are performed in a virtual reality environment at the Center. In the photo above, a young hockey player has his balance tested during his baseline test. Read more about both baseline testing and the story of one former athlete who still suffers from a concussion she sustained in 2009, in a feature originally published in Research/Penn State magazine. Members of the news media interested in the Center for Concussion Research and Service should contact Katie Finelli at 814-863-3883 or klf5008@psu.edu.